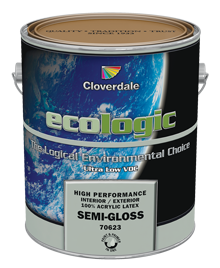 EcoLogic® Ultra Low VOC Interior/Exterior Waterborne Semi-Gloss finish is one of the finishes in the near zero VOC High Performance coatings specifically formulated to replace alkyd base products in hospitals, schools, heavy duty institutional and light industrial areas. Self-priming on most interior or exterior surfaces including previously painted surfaces, drywall, concrete block, masonry, composite siding materials and wood*. EcoLogic® finishes are formulated for repainting areas that require a tough, durable, non-yellowing, scrubbable, low odour finish. This product is lead free and resists mildew, moisture and dirt. EcoLogic® Waterborne Semi-Gloss coating meets Environment Canada’s VOC limits for Architectural and Industrial Maintenance Coatings. Approved by the Master Painters Institute under category #141, # 153 #, #163 and #311. Gloss level 5.